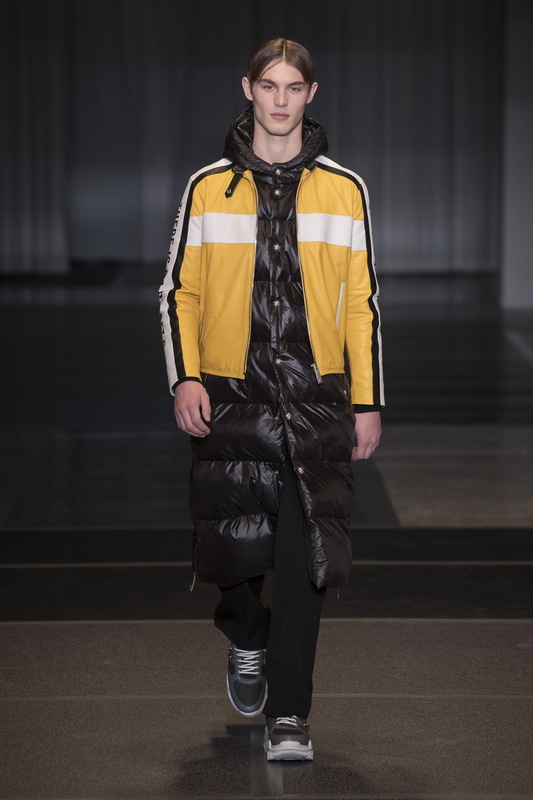 John Richmond showed his Fall Winter 2018 2019 collection during the Milan Fashion Week. The collection is ‘typical Richmond’: a strong mix of beat, hip hop, rock and a bit of romanticism, always with a classy twist. No rules, only interesting mistakes. On the catwalk Richmond shows exaggerated wide trousers, an oversized puffa, motocross jack hoods, socks and pointy shoes, fake furs, day mixed with night. 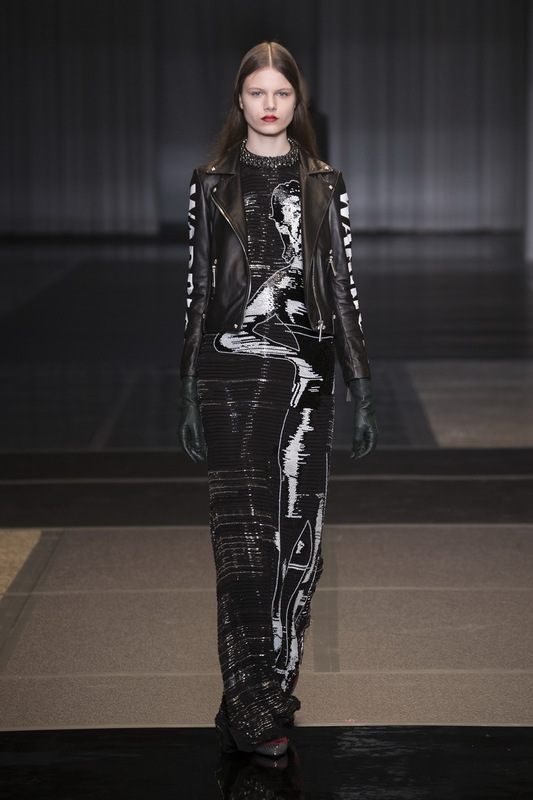 Distorted proportion, layers and ‘mix and maybe not matched‘ are Leitmotivs in this winter collection. We interviewed the British designer backstage. Watch the interview and enjoy the show. Can you tell us more about the inspiration for this collection? The inspirational is very eclectic. You know I like this mood at the moment of taking things from the past you know or real things not just the influence, you know as unfortunately I have a long history of also I created in the early 90s, I had a brand called destroy… I had John Richmond and I had this little label on the side which is where all the club kids used to buy in UK. So is this very strong, I even took old pieces and remade them just odd little t-shirts and some of the branding and it was really nice to mix that with what’s happening now, and don’t have that coming in you have this evening where mixed in with day where big puffer jackets, and evening dresses mixed with leather dresses, over skirts and really it’s much more… street… more street than probably most Milan shows because Milan shows tend to be more… glitzy, to show up, where this is much more on the floor. What is the most representative item in this collection? At the end of the show there’s an orange puffer jacket over a black see-through evening dress which is one of my favorites. But another strong element in this collection is the slogans I’ve tried to bring in. I think probably influenced by the fact I have a young son who’s 7 years old you know, at school they learn a lot about taking care of the world and the fact that they need to take care of the world and I think now I have a space today I have a catwalk and I’ve used lots of slogans on the clothes so you know there is no Planet B because we don’t have a Planet B, we have to look after this planet and it’s something I want to do more and more you know I’m not being a politician but John Richmond there’s one person can influence you know fifty people those fifty people can influence another 50 60 and it could the message can spread I think we are we all know about it but all but we all need to be much more conscientious and take it seriously. You seem very relaxed not like a designer who has a fashion show in 30 minutes how do you manage? I’ve always had an attitude that you have to… it’s all about preparation… you know so you have to get it here before the day of the show. Because you know you could run around and scream but it’s it’s not going to change anything, you can’t change anything now it’s too late. What’s here is here and it’s done and it’s prepared in the last four days so you’re a ready for it… I think you know you just have to take it, that’s it, let’s not try and mess around this. Let’s make what we have here work well. I am already in doing the next collection, so I’m already… my head’s already there!